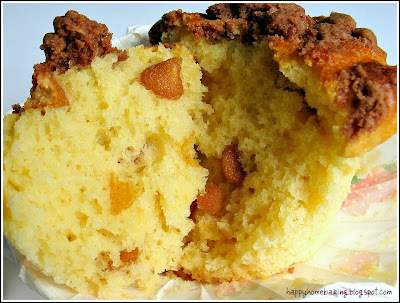 I love baking muffins, and nothing beats having a homemade muffin over a cup of hot coffee for breakfast! I made this batch of yummy muffins following a recipe which is meant for a chocolate chips & crumble muffins. Instead of chocolate chips I replaced it with some left over peanut butter chips. I was quite happy with how the muffins turned out, it was worth the little extra effort required to make the chocolate crumble toppings. By the way, did you know that there were actually three muffins in the above image? This recipe calls for rubbing in the butter to flour instead of the usual way of using melted butter or creaming butter with sugar. The resulting batter was rather watery as compared to the usual thick and gooey mixture which I was more familiar with. I filled a few of the muffins cups almost to the brim (I used only 10 muffin cups instead of the recommended 12), as such a couple of them had batter spilled over the cups...looking not too different from a volcanic eruption! I had some difficulty rubbing in the butter while making the chocolate crumbles...I guess the flour was too little for the amount of butter used. Most of the crumbles were really huge! For the chocolate crumble topping, sift flour and cocoa powder into a bowl. Mix in the sugar and rub in the butter until the mixture resembles coarse breadcrumbs. Set aside. Mix flour, baking powder and salt in a mixing bowl. Rub in the butter until the mixture resembles breadcrumbs. Stir in the sugar and the peanut butter chips. In another bowl, mix eggs, milk and vanilla extract. Pour the liquid mixture all at once into the dry ingredients. With a wooden spoon or spatula, mix until just combined. Do Not Over Mix. The batter should remain lumpy. 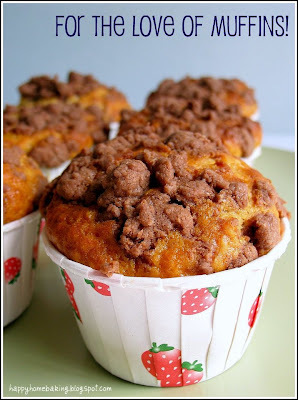 Fill paper muffin cups with batter sprinkle with the crumble toppings. Bake in a preheated oven at 200degC for 18-20mins, or until well risen and firm to the touch. A skewer inserted into the centre should come out clean. Let cool completely. 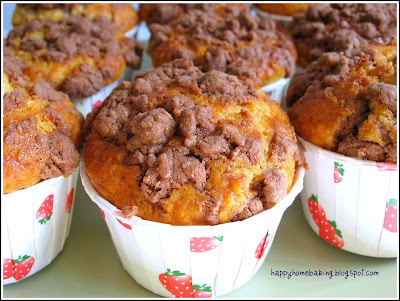 Hi HHB, these muffin looks delicious. Hopefully can have a piece and a cup of coffee with you to know your baking story. These are some really nice and pretty looking muffins! Looks delicious too. Wow...I love muffins that rises so high...It's uch a satisfaction when you see it rise up while baking in the oven. It looks great and yummy too!! I like your photos and the muffins look fantastic! Your muffins look delicious! I use the exact same muffin cases when I bake muffins too. I noticed that most (if not all) muffin recipes around don't yield the type that is so HUGELY popular in Singapore, you know, the ones sold by this stall at Shunfu Mart (i forgot the name, sorry!). I also wonder if anyone knows the recipe to the muffins made by Missy Muffin, the stall that got help from the Channel 8 program. In that show, they got some professional chef to come up with an improved recipe and teach the stallholder how to make it. 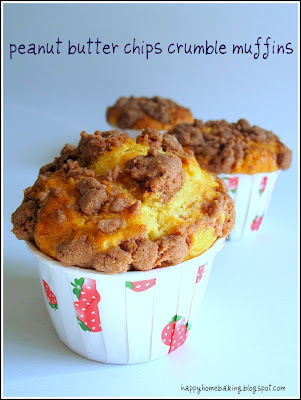 It sure looks much more complicated than most muffin recipes I know! Anyway, just to share my thoughts. Your photos look great as usual! I saw this book at the bookstore. It looks really interesting. Will try out this recipe. 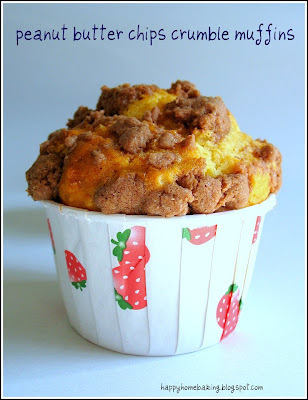 Hi HHB, I'm not a muffin person but looking at your pictures, I'm so going to try it tonight. I also have some peanut butter chips to be used! 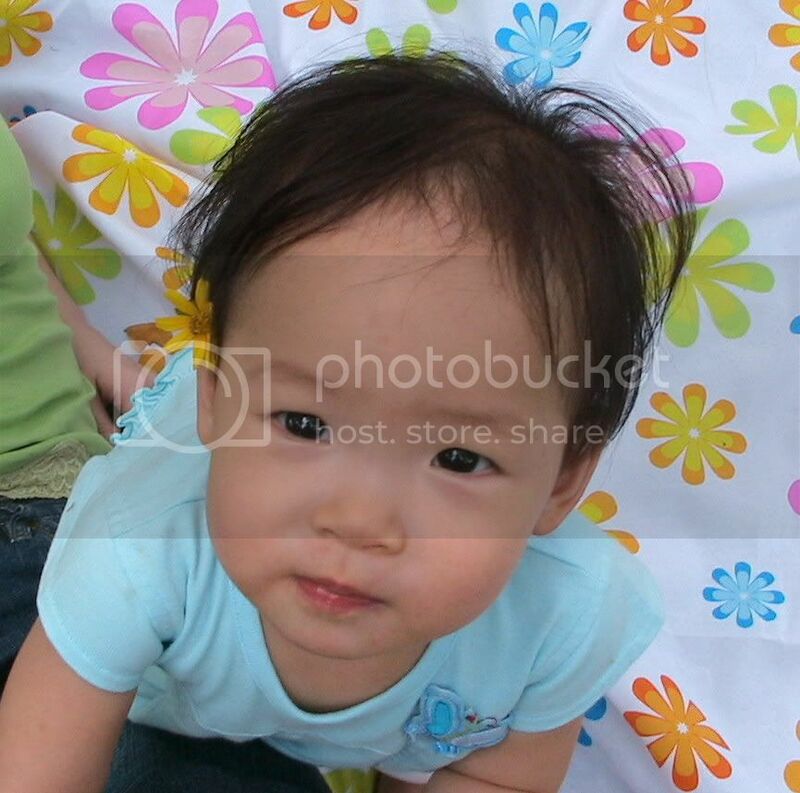 Very nicely taken photos! Aimei, oh yes, it was really a joy when all the muffins were all puffed up while they were in the oven! Hi SSB, as usual, I borrowed the book from the library...there is a series of books...Cakes Galore, Cookies Galore and Cupcake Galore...all available in the library. Try the one at Bishan, there are newer books at that branch. Yuri, do give it a try, I hope you will like it! They look so yummy! They rose so high. I'm still trying to figure out how to achieve that. Superb! I have never made muffins this way. They look delicious. they look nice! i've never made brownies like that method, love the peanut butter chips! These look yummy :). I love the strawberry holders, too! Oh, and in case you're wanting these to be a little more moist, next time around add about 1/2 cup applesauce! 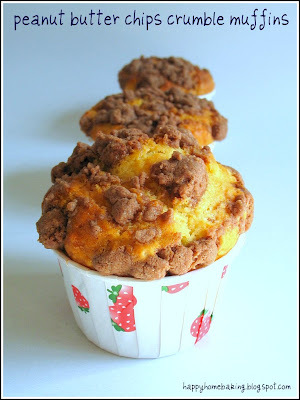 It works wonders and it's lowfat, so it's a win-win situation :D.
This muffin looks very yummy! Thanks for the recipe.